66 percent of small business owners manage IT for their businesses and nearly 31 percent fill even more roles, from CFO to CMO, COO and CIO. At Key communications we understand Brisbane businesses need cost-effective, secure and reliable solutions that will relieve the burden of managing their business IT and Marketing requirements, freeing them to build their businesses and enabling them to be productive from anywhere. So choose Keycomm for IT support Brisbane! A comprehensive IT management service combining your networking, security and general IT requirements to ensure every facet of your IT infrastructure is monitored and managed to deliver peak performance to your business. Sick of the Hard Sell! Searching for Real Solutions? Key Communications helps small and medium Brisbane businesses take back control of there business services, improving accessibility, lowering overheads and refocusing your teams efforts back onto building your business rather than investing time and effort (that you don't have) into facilitating services required to do business. Complete computer inventory and software inventory. Scheduled LAN audits. Fully automated and always up-to-date. Access computers remotely from anywhere. Secure and configurable. Access PCs behind firewalls and NAT without port mapping or infrastructure changes. Fully automated security patch scan, patch deployment and history with the click of a mouse. Scalable, secure, configurable and location independent. Instant notification for hardware changes, software changes, policy violations, low disk space, unapproved network access, new devices on the LAN, etc. Complete software installations and software updates across the organization with a mouse click. Easier and more flexible than SMS and other solutions. Monitor network usage by machine and by application. Define policies and limit network access to only corporate approved applications. Comprehensive integrated management and operational reports. Customizable, always available to users with permission. ...and How your business is marketed. Preparing for Disaster - Do you have a Data Recovery Plan? Will your business recover from a disaster such as flood, fire or theft? What will it cost if you lost your data? We're a friendly bunch so feel free to say Hi! Even if we do say so ourselves! The reality is that the way Brisbane businesses are communicating is changing, and rapidly; our aim is to provide more than a list of the latest mobile phones, we aim to equip Brisbane businesses with a strategy for modernizing their business communications, how do we do this? Get in contact and we'll show you how! Are you completely satisfied with your Business services? 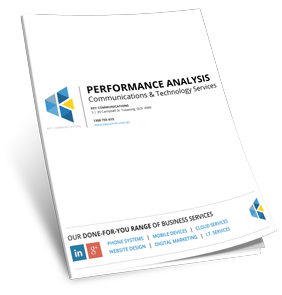 We understand better than most the impact technology is having on the way Brisbane businesses are doing business, our aim is to provide more than cloud services, we want to equip you with a strategy for modernizing your business communications.